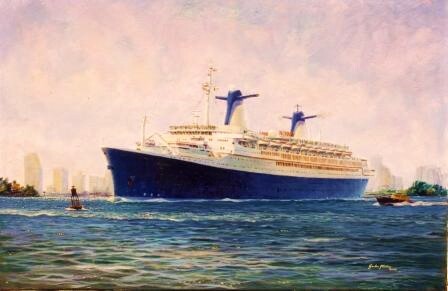 SS Norway, a marine art by Gordon Frickers 61 x 91 cm (24″ x 36″), oils on canvas, looking for a good home, would suit a private collection, shipping company or hotel, available. Norway made one of her spectacular departures while the artist, Gordon Frickers, was having breakfast at Government Cut pier head, Miami Beach, Florida. The problem is always how to find the decision makers in the company and get their attention; remiss of me. This painting really would look splendid in the Norwegian Caribbean Cruise Lines offices or on one of their ships. More likely it will eventually grace a restaurant in the Middle East as quite a few of my others have. The former France, built as a deep draught Atlantic liner she drew so much water she created a serious suction in the narrowest part of “the Government Cut, Miami“. Local surfers knew this and would wait for Norway to use her 5 foot high backwash as a long free ride. At the time Norway ex France was the longest passenger ship of the day. Thus the painting “Norway departing Miami” has recorded something of the day I was there, a very personal salute to the company and a glorious ship. You could commission a similar painting.